Richard was born in Oxfordshire at Beaumont Palace in September 1157. Records reveal that the cost of Queen Eleanor’s laying in was accounted at 20 shillings. Though born in England, the second of four surviving sons, he was destined to inherit Queen Eleanor’s duchy of Aquitaine. He grew up in an atmosphere of courtly love, speaking the langue d’oc. Today we think of him as a warrior but he was an accomplished musician thanks to his early years in Eleanor’s court. Ralph of Coggleshall, records the fact that he ‘conducted’ the clerks of the Royal Chapel in song. By the time Richard was ten his father (Henry II) had betrothed Richard to the daughter of Count Richmond of Barcelona. Nothing came of this engagement but in 1168 when Richard was formally invested with the Duchy of Aquitaine he was betrothed to Princess Alys of France, the daughter of King Louis VII – his mother’s ex-husband- by his second wife. Presumably the laws of consanguinity did not account for such things. What they did account for though was a father ‘knowing’ his son’s bride. Alys came to Henry II’s court and eventually Henry made her his mistress which goes some way towards explaining Richard’s reticence when it came to honouring the engagement. By 1173 Henry II’s relationships with all his sons had reached breaking point. Henry expended huge amounts of energy creating an empire that stretched from the Welsh Marches to the Pyrenees. He did not wish to do homage to King Louis VII so he gave his European lands into the keeping of his sons Henry, Geoffrey and Richard. He even went so far as to have Henry crowned king of England while he was still living. However, they were rulers in name only. Henry retained the power. His sons rebelled. Queen Eleanor, perhaps tiring of Henry’s infidelities, her own lack of power and a mother’s need to protect her sons joined in the rebellion. Fortunately for Henry, Eleanor was swiftly captured and then subjected to fifteen years of captivity. Monarchs on the edge of his kingdom added their armies to the fray. Young Prince Richard battled on, attempting to besiege La Rochelle despite the fact that King Louis unable to capture Rouen had sued for peace. King William of Scotland had been roundly beaten at Alnwick. Was it stubbornness? Was it anger at his mother’s treatment? Or was it simply because his father excluded him from the peace that he negotiated with King Louis? In any event, it was 23 September 1174 before he threw himself on his father’s mercy. In 1175 Henry set his son the task of quelling the Aquitanian nobles who had risen with Richard two years earlier. Richard set about subduing nobles and towns one by one. Limoges fell having been besieged for only two days. He was accused, in Aquitaine, of being ‘evil to all men.’ Yet he succeeded where his father could not. He went on to make the road through to the Pyrenees safe for travellers, thus furthering his father’s diplomatic allegiances with Spain. In 1179 Richard sided with his father when his brothers Henry (the Young King) and Geoffrey (Count of Brittany) rebelled once more. Four years later Henry was dead of dysentery and Richard was heir to the English throne. King Henry ordered Richard to hand over Aquitaine to Prince John. Richard refused. He held an ostentatious Christmas court at Talmont where he gave generous New Year gifts to his nobles. He’d fought long and hard for the kingdom that was his mother’s and he had no intention of handing it over to his little brother despite the fact that allocating inheritances between sons in this manner was a normal procedure. He showed no sign of backing down even when Henry openly toyed with the idea of marrying Princess Alys off to John and bypassing Richard altogether. Roger of Hoveden’s account shows that King Philip of France (Louis VII’s much long for son) would not agree to this. Eventually King Henry informed John that he could have Aquitaine if he could take it. Inevitably these family tensions led to Richard coming to terms with the King of France. It was this coming to terms that has given history pause for thought about Henry’s sexual orientation despite the existence of two illegitimate sons. It was reported that Philip and Richard shared the same bed following a day of negotiations. It was not regarded with the raised eyebrows of today and suggests instead a symbolic sealing of an agreement. Richard was not the callow youth he’d been last time he’d rebelled against his father, nor was his father a well man. Neither for that matter was Philip much like his father in matters of warfare. Eventually the city of Le Mans was captured and Henry was forced to flee. The king sued for peace. He came to terms with the french king and Richard during a thunder-storm. He was so shattered that his men had to hold him upright on his horse. Some accounts describe a tear in Henry’s back passage that bled so much during the hours of negotiation that the blood streamed down his horse’s flanks. Henry, vanquished and in pain, returned to Chinon a broken man having learned that John, the son for whom he’d gone to war, had betrayed him. 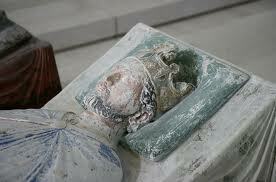 Henry died on the 6th July 1189. Prince Richard, Duke of Aquitaine was now King Richard I. One of the first things he did was to give orders setting Eleanor free from her captivity. This entry was posted in The Plantagenets, Twelfth Century and tagged Aquitaine, Chinon, Eleanor of Aquitaine, Henry II, Princess Alys, Richard I, Richard the Lionheart, Talmont by JuliaH. Bookmark the permalink.